The cottage design calls for one window to be placed in a concrete wall. I was curious how this is done. What happens is that the foundation contractor actually embeds the window right inside the concrete form as they pour the concrete walls. So the window is not crushed by the weight of the concrete and the concrete pouring operation, the contractor takes the glass part of the window out and temporarily replaces them with wooden support. 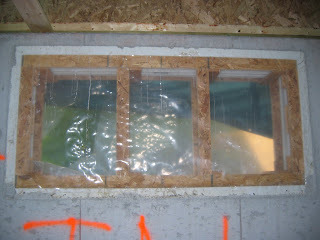 The whole window assembly is covered in thick plastic to protect it from the concrete. After the concrete is cured and the forms are removed, the window becomes a seamless part of the wall structure. The wood supports are removed and the glass parts of the window are inserted, usually after the window opening is used to pour the concrete for the basement floor - but that is a story for another post.